“There is a time for everything…a time to weep and a time to laugh, a time to mourn and a time to dance. It was only supposed to take a few hours to scout out a good canoe route. But when James Brill and Scott Nesbitt weren’t back in time for dinner, their wives, sisters Heather and Holly Wall, started to pray. They didn’t stop—even when the bodies of their beloved husbands turned up a day later in the rushing river. 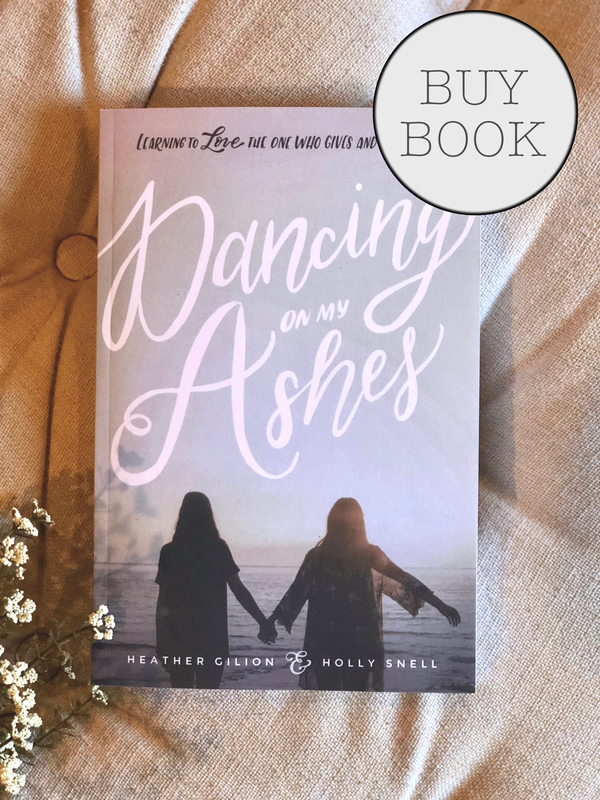 Dancing On My Ashes is a true story that details the painful passage of two young widows out of the ashes and into their dance with the Almighty God. Do you remember the moment you saw Him? The exact moment your eyes met, and you knew in that second you were forever changed? Do you remember the moment He saw you—right through you? There was no place to hide, no use in cowering, for your heart and your thoughts were laid bare before His eyes. He knew your name, and as He spoke it, everything in you melted, even the very thing that you thought you had protected—your hardened heart. When I encountered this living God, my world was destroyed. All I once knew about this God became fairy tales and fables, and a man like no other emerged from the fire. But was He a man at all? The smoke around Him was so thick from the flames that consumed my world that I couldn’t make out His face, but I knew that He was coming toward me. He was coming for me. Could He be the one to rescue me from these flames? Then again, wasn’t He the one who had caused the blaze, the heat, this destruction? Caught in His path, I was frozen with fear—not the fear that makes you hide, but the kind that makes you defenseless. I was helpless as I fell to my knees. That was the moment I knew my world was at its end. As the smoke cleared, and my eyes beheld His throne, the veil was torn, and He beckoned me to come into the Holy of Holies. As the song says, “This is my story; this is my song.” In this story, my world collided with His, and for a mere moment, I was face-to-face with God. Scripture speaks that no one can see His face and live. This is true; I had to die. This crisis brought my kingdom—the kingdom I had created and built with my two hands—to mere ashes in an instant. I stood before a king; let me rephrase that: I stood before the King. And inside this King’s kingdom, what He says goes. My moment before the King was a day of reckoning—a reckoning and wrecking of my life as I knew it. On an altar before me, everything I valued was consumed before my very eyes; but as one died that day, another was brought to life. I laid myself—my weaknesses and my doubts—bare before me in this feeble attempt to communicate my moment of death to you. Fear tries to make his home in my heart, but fear may not reside there, for God ordained this journey for me to partake in and for you to witness. He longs for you to see Him so much so that He woke this servant in the middle of the night to begin telling a story. This is a love story of God loving me so much that He would allow me to experience great pain and great loss to lose everything yet gain my soul. This love didn’t care about reputation; He didn’t care about my living out laws. Love cared enough to save me from myself and became the offer I couldn’t refuse. I couldn’t run fast enough, or hide far enough, and I couldn’t put Him in a box and save Him for later. This unmerited, abounding, extravagant love answered my questions of who and why. I tell you this story in faith, not to glorify my name, but to make much of one name: the name of Jesus Christ. This journey that unravels before you will be one of a terrific triumph over tragedy, a heart-wrenching surrender, and an unforgettable journey to His heights. A journey—I must add—I’m still on. This is my journey of pursuit and death, and I pray that this story will not be merely a story but an invitation for you to see the Lord too. He longs to write our story. The Lord has the characters all in place; He knows the twists and turns, and He knows the moment when all else will fade away, and we will be faced with the face of Christ. What He does with us will be up to Him, but what we do next will be up to us. Stepping out of our kingdoms and into His—that is our journey. The kingdom of God is at hand! The King is calling for you. Do you hear Him? He’s calling your name. To purchase the book, go HERE!